Malawi (/məˈlɔːwi/, /məˈlɑːwi/ or /ˈmæləwi/; Chichewa: [maláβi] or [maláwi]), officially the Republic of Malawi, is a landlocked country in southeast Africa that was formerly known as Nyasaland. It is bordered by Zambia to the northwest, Tanzania to the northeast, and Mozambique on the east, south and west. Malawi is over 118,000 km2 (45,560 sq mi) with an estimated population of 18,091,575 (as at July 2016). Lake Malawi takes up about a third of Malawi's area. Its capital is Lilongwe, which is also Malawi's largest city; the second largest is Blantyre, the third is Mzuzu and the fourth largest is its old capital Zomba. The name Malawi comes from the Maravi, an old name of the Nyanja people that inhabit the area. The country is also nicknamed "The Warm Heart of Africa" because of the friendliness of the people. The part of Africa now known as Malawi was settled by migrating Bantu groups around the 10th century. Centuries later in 1891 the area was colonised by the British. In 1953 Malawi, then known as Nyasaland, a protectorate of the United Kingdom, became a protectorate within the semi-independent Federation of Rhodesia and Nyasaland. The Federation was dissolved in 1963. In 1964 the protectorate over Nyasaland was ended and Nyasaland became an independent country under Queen Elizabeth II with the new name Malawi. Two years later it became a republic. Upon gaining independence it became a totalitarian one-party state under the presidency of Hastings Banda, who remained president until 1994. Malawi has a democratic, multi-party government headed by an elected president, currently Arthur Peter Mutharika. The country has a Malawian Defence Force that includes an army, a navy and an air wing. Malawi's foreign policy is pro-Western and includes positive diplomatic relations with most countries and participation in several international organisations, including the United Nations, the Commonwealth of Nations, the Southern African Development Community (SADC), the Common Market for Eastern and Southern Africa (COMESA), and the African Union (AU). Malawi is among the world's least-developed countries. The economy is heavily based in agriculture, with a largely rural population. The Malawian government depends heavily on outside aid to meet development needs, although this need (and the aid offered) has decreased since 2000. The Malawian government faces challenges in building and expanding the economy, improving education, healthcare, environmental protection, and becoming financially independent amidst widespread unemployment. Since 2005, Malawi has developed several programs that focus on these issues, and the country's outlook appears to be improving, with a rise in the economy, education and healthcare seen in 2007 and 2008. Malawi has a low life expectancy and high infant mortality. There is a high prevalence of HIV/AIDS, which is a drain on the labour force and government expenditures. There is a diverse population of native peoples, Asians and Europeans, with several languages spoken and an array of religious beliefs. Although there was periodic regional conflict fuelled in part by ethnic divisions in the past, by 2008 it had diminished considerably and the concept of a Malawian nationality had reemerged. ✪ Malawi Travel Vlog | The Warm Heart of Africa SHOOK Me! The area of Africa now known as Malawi had a very small population of hunter-gatherers before waves of Bantu peoples began emigrating from the north around the 10th century. [citation needed] Although most of the Bantu peoples continued south, some remained permanently and founded ethnic groups based on common ancestry. By 1500 AD, the tribes had established the Kingdom of Maravi that reached from north of what is now Nkhotakota to the Zambezi River and from Lake Malawi to the Luangwa River in what is now Zambia. Soon after 1600, with the area mostly united under one native ruler, native tribesmen began encountering, trading with and making alliances with Portuguese traders and members of the military. By 1700, however, the empire had broken up into areas controlled by many individual ethnic groups. The Arab slave trade reached its height in the mid- 1800s, when approximately 20,000 people were enslaved and considered to be carried yearly from Nkhotakota to Kilwa where they were sold. Missionary and explorer David Livingstone reached Lake Malawi (then Lake Nyasa) in 1859 and identified the Shire Highlands south of the lake as an area suitable for European settlement. As the result of Livingstone's visit, several Anglican and Presbyterian missions were established in the area in the 1860s and 1870s, the African Lakes Company Limited was established in 1878 to set up a trade and transport concern working closely with the missions, and a small mission and trading settlement was established at Blantyre in 1876 and a British Consul took up residence there in 1883. The Portuguese government was also interested in the area so, to prevent Portuguese occupation, the British government sent Harry Johnston as British consul with instructions to make treaties with local rulers beyond Portuguese jurisdiction. In 1889, a British protectorate was proclaimed over the Shire Highlands, which was extended in 1891 to include the whole of present-day Malawi as the British Central Africa Protectorate. In 1907, the protectorate was renamed Nyasaland, a name it retained for the remainder of its time under British rule. In a prime example of what is sometimes called the "Thin White Line" of colonial authority in Africa, the colonial government of Nyasaland was formed in 1891. The administrators were given a budget of £10,000 (1891 nominal value) per year, which was enough to employ ten European civilians, two military officers, seventy Punjab Sikhs and eighty-five Zanzibar porters. These few employees were then expected to administer and police a territory of around 94,000 square kilometres with between one and two million people. In 1944, the Nyasaland African Congress (NAC) was formed by the Africans of Nyasaland to promote local interests to the British government. In 1953, Britain linked Nyasaland with Northern and Southern Rhodesia in what was the Federation of Rhodesia and Nyasaland, often called the Central African Federation (CAF), for mainly political reasons. Even though the Federation was semi-independent, the linking provoked opposition from African nationalists, and the NAC gained popular support. An influential opponent of the CAF was Dr. Hastings Banda, a European-trained doctor working in Ghana who was persuaded to return to Nyasaland in 1958 to assist the nationalist cause. Banda was elected president of the NAC and worked to mobilise nationalist sentiment before being jailed by colonial authorities in 1959. He was released in 1960 and asked to help draft a new constitution for Nyasaland, with a clause granting Africans the majority in the colony's Legislative Council. In 1961, Banda's Malawi Congress Party (MCP) gained a majority in the Legislative Council elections and Banda became Prime Minister in 1963. The Federation was dissolved in 1963, and on 6 July 1964, Nyasaland became independent from British rule and renamed itself Malawi. Under a new constitution, Malawi became a republic with Banda as its first president. The new document also formally made Malawi a one-party state with the MCP as the only legal party. In 1971, Banda was declared president-for-life. For almost 30 years, Banda presided over a rigidly totalitarian regime, which ensured that Malawi did not suffer armed conflict. Opposition parties, including the Malawi Freedom Movement of Orton Chirwa and the Socialist League of Malawi, were founded in exile. Malawi's economy while Banda was president was often cited as an example of how a poor, landlocked, heavily populated, mineral-poor country could achieve progress in both agriculture and industrial development. While in office, and using his control of the country, Banda constructed a business empire that eventually produced one-third of the country's GDP and employed 10% of the wage-earning workforce. All money earned by Banda was ploughed back into developing Malawi[citation needed] and was symbolised by the building of a top boarding school called Kamuzu Academy (Eton of Africa). In Banda's own words "I do not want my boys and girls to do what I had to do — to leave their homes and their families and go away from Malawi to get an education", was the reason for gifting this school to Malawi. Under pressure for increased political freedom, Banda agreed to a referendum in 1993, where the populace voted for a multi-party democracy. In late 1993 a presidential council was formed, the life presidency was abolished and a new constitution was put into place, effectively ending the MCP's rule. In 1994 the first multi-party elections were held in Malawi, and Banda was defeated by Bakili Muluzi (a former Secretary General of the MCP and former Banda Cabinet Minister). Re-elected in 1999, Muluzi remained president until 2004, when Dr. Bingu wa Mutharika was elected. Although the political environment was described as "challenging", it was stated in 2009 that a multi-party system still existed in Malawi. Multiparty parliamentary and presidential elections were held for the fourth time in Malawi in May 2009, and President Mutharika was successfully re-elected, despite charges of election fraud from his rival. President Mutharika was seen by some as increasingly autocratic and dismissive of human rights, and in July 2011 protests over high costs of living, devolving foreign relations, poor governance and a lack of foreign exchange reserves erupted. The protests left 18 people dead and at least 44 others suffering from gunshot wounds. In April 2012, Mutharika died of a heart attack; the presidential title was taken over by former Vice-President Joyce Banda. In 2014 Joyce Banda lost elections (coming third) and was replaced by Arthur Peter Mutharika, the brother of ex-President Mutharika. Arthur Peter Mutharika, President of Malawi. Malawi is a democratic, multi-party government, currently under the leadership of Arthur Peter Mutharika, who defeated former president Joyce Banda in the 2014 elections, despite alleged poll rigging. The current constitution was put into place on 18 May 1995. The branches of the government consist of executive, legislative and judicial. The executive includes a president who is both chief of state and head of government, first and second vice presidents and a cabinet. The president and Vice President are elected together every five years. A second vice president may be appointed by the president if so chosen, although they must be from a different party. The members of the cabinet are appointed by the president and can be from either inside or outside of the legislature. The legislative branch consists of a unicameral National Assembly of 193 members who are elected every five years, and although the Malawian constitution provides for a Senate of 80 seats, one does not exist in practice. If created, the Senate would provide representation for traditional leaders and a variety of geographic districts, as well as special interest groups including the disabled, youth and women. There are currently nine political parties, with the Democratic Progressive Party acting as the ruling party, it is in an unofficial coalition with United Democratic Front. the Malawi Congress Party currently led by Reverend Lazarus Chakwera is the main opposition party. Suffrage is universal at 18 years of age, and the central government budget for 2009/2010 is $1.7 billion. The independent judicial branch is based upon the English model and consists of a Supreme Court of Appeal, a High Court divided into three sections (general, constitutional and commercial), an Industrial Relations Court and Magistrates Courts, the last of which is divided into five grades and includes Child Justice Courts. The judicial system has been changed several times since Malawi gained independence in 1964. Conventional courts and traditional courts have been used in varying combinations, with varying degrees of success and corruption. In February 2005, President Mutharika split with the United Democratic Front and began his own party, the Democratic Progressive Party, which had attracted reform-minded officials from other parties and won by-elections across the country in 2006. In 2008, President Mutharika had implemented reforms to address the country's major corruption problem, with at least five senior UDF party members facing criminal charges. In 2012, Malawi was ranked 7th of all countries in sub-Saharan Africa in the Ibrahim Index of African Governance, an index that measures several variables to provide a comprehensive view of the governance of African countries. Although the country's governance score was higher than the continental average, it was lower than the regional average for southern Africa. Its highest scores were for safety and rule of law, and its lowest scores were for sustainable economic opportunity, with a ranking of 47th on the continent for educational opportunities. Malawi's governance score had improved between 2000 and 2011. Malawi held its most recent elections in May 2014, with challenger Arthur Peter Mutharika defeating incumbent President Joyce Banda. Former President Hastings Banda established a pro-Western foreign policy that continued into early 2011. It included good diplomatic relationships with many Western countries. The transition from a one-party state to a multi-party democracy strengthened Malawian ties with the United States. Significant numbers of students from Malawi travel to the US for schooling, and the US has active branches of the Peace Corps, the Centers for Disease Control and Prevention, the Department of Health and Human Services and the Agency for International Development in Malawi. Malawi maintained close relations with South Africa throughout the Apartheid era, which strained Malawi's relationships with other African countries. Following the collapse of apartheid in 1994, diplomatic relationships were made and maintained into 2011 between Malawi and all other African countries. In 2010, however, Malawi's relationship with Mozambique became strained, partially due to disputes over the use of the Zambezi River and an inter-country electrical grid. In 2007, Malawi established diplomatic ties with China, and Chinese investment in the country has continued to increase since then, despite concerns regarding treatment of workers by Chinese companies and competition of Chinese business with local companies. In 2011, relations between Malawi and the United Kingdom were damaged when a document was released in which the British ambassador to Malawi criticised President Mutharika. Mutharika expelled the ambassador from Malawi, and in July 2011, the UK announced that it was suspending all budgetary aid because of Mutharika's lack of response to criticisms of his government and economic mismanagement. On 26 July 2011, the United States followed suit, freezing a US$350 million grant, citing concerns regarding the government's suppression and intimidation of demonstrators and civic groups, as well as restriction of the press and police violence. Malawi has been seen as a haven for refugees from other African countries, including Mozambique and Rwanda, since 1985. These influxes of refugees have placed a strain on the Malawian economy but have also drawn significant inflows of aid from other countries. Donors to Malawi include the United States, Canada, Germany, Iceland, Japan, the Netherlands, Norway, Sweden, Ireland, the UK and Flanders (Belgium), as well as international institutions such as the World Bank, the International Monetary Fund, the European Union, the African Development Bank and UN organisations. Malawi is a member of several international organisations including the Commonwealth, the UN and some of its child agencies, the IMF, the World Bank, the African Union and the World Health Organization. Malawi tends to view economic and political stability in southern Africa as a necessity, and advocates peaceful solutions through negotiation. The country was the first in southern Africa to receive peacekeeping training under the African Crisis Response Initiative. As of 2017[update], international observers noted issues in several human rights areas. Excessive force was seen to be used by police forces, security forces were able to act with impunity, mob violence was occasionally seen, and prison conditions continued to be harsh and sometimes life-threatening. However, the government was seen to make some effort to prosecute security forces who used excessive force. Other legal issues included limits on free speech and freedom of the press, lengthy pretrial detentions, and arbitrary arrests and detentions. Societal issues found included violence against women, human trafficking, and child labour. Corruption within the government is seen as a major issue, despite the Malawi Anti-Corruption Bureau's (ACB) attempts to reduce it. The ACB appears to be successful at finding and prosecuting low level corruption, but higher level officials appear to be able to act with impunity. Corruption within security forces is also an issue. Malawi had one of the highest rates of child marriage in the world. In 2015 Malawi raised the legal age for marriage from 15 to 18. Other issues that have been raised are lack of adequate legal protection of women from sexual abuse and harassment, very high maternal mortality rate, and abuse related to accusations of witchcraft. As of 2010[update], homosexuality has been illegal in Malawi. In one 2010 case, a couple perceived as homosexual faced extensive jail time when convicted. The convicted pair, sentenced to the maximum of 14 years of hard labour each, were pardoned two weeks later following the intervention of United Nations Secretary General Ban Ki-moon. In May 2012, then-President Joyce Banda pledged to repeal laws criminalising homosexuality. The Great Rift Valley runs through the country from north to south, and to the east of the valley lies Lake Malawi (also called Lake Nyasa), making up over three-quarters of Malawi's eastern boundary. Lake Malawi is sometimes called the Calendar Lake as it is about 587 kilometres (365 mi) long and 84 kilometres (52 mi) wide. The Shire River flows from the south end of the lake and joins the Zambezi River 400 kilometres (250 mi) farther south in Mozambique. The surface of Lake Malawi is located at 457 metres (1,500 ft) above sea level, with a maximum depth of 701 metres (2,300 ft), which means the lake bottom is over 213 metres (700 ft) below sea level at some points. In the mountainous sections of Malawi surrounding the Rift Valley, plateaus rise generally 914 to 1,219 metres (3,000 to 4,000 ft) above sea level, although some rise as high as 2,438 metres (8,000 ft) in the north. To the south of Lake Malawi lie the Shire Highlands, gently rolling land at approximately 914 metres (3,000 ft) above sea level. In this area, the Zomba and Mulanje mountain peaks rise to respective heights of 2,134 and 3,048 metres (7,000 and 10,000 ft). Malawi's capital is Lilongwe, and its commercial centre is Blantyre with a population of over 500,000 people. Malawi has two sites listed on the UNESCO World Heritage List. Lake Malawi National Park was first listed in 1984 and the Chongoni Rock Art Area was listed in 2006. Malawi's climate is hot in the low-lying areas in the south of the country and temperate in the northern highlands. The altitude moderates what would otherwise be an equatorial climate. Between November and April the temperature is warm with equatorial rains and thunderstorms, with the storms reaching their peak severity in late March. After March, the rainfall rapidly diminishes and from May to September wet mists float from the highlands into the plateaus, with almost no rainfall during these months. The ecoregions include tropical and subtropical grasslands, savannas, and shrublands of the miombo woodland, dominated by miombo trees; and the Zambezian and mopane woodlands, characterized by the mopane tree; and also flooded grassland providing grassland and swamp vegetation. There are five national parks, four wildlife and game reserves and two other protected areas in Malawi. Malawi is among the world's least developed countries. Around 85% of the population live in rural areas. The economy is based on agriculture, and more than one-third of GDP and 90% of export revenues come from this. In the past, the economy has been dependent on substantial economic aid from the World Bank, the International Monetary Fund (IMF), and other countries. Malawi was ranked the 119th safest investment destination in the world in the March 2011 Euromoney Country Risk rankings. In addition, some setbacks have been experienced, and Malawi has lost some of its ability to pay for imports due to a general shortage of foreign exchange, as investment fell 23% in 2009. There are many investment barriers in Malawi, which the government has failed to address, including high service costs and poor infrastructure for power, water, and telecommunications. As of 2009[update], it was estimated that Malawi had a GDP (purchasing power parity) of $12.81 billion, with a per capita GDP of $900, and inflation estimated at around 8.5% in 2009. Agriculture accounts for 35% of GDP, industry for 19% and services for the remaining 46%. Malawi has one of the lowest per capita incomes in the world, although economic growth was estimated at 9.7% in 2008 and strong growth is predicted by the International Monetary Fund for 2009. The poverty rate in Malawi is decreasing through the work of the government and supporting organizations, with people living under the poverty line decreasing from 54% in 1990 to 40% in 2006, and the percentage of "ultra-poor" decreasing from 24% in 1990 to 15% in 2007. The economy of Malawi is predominantly agricultural. Over 80% of the population is engaged in subsistence farming, even though agriculture only contributed to 27% of GDP in 2013. The services sector accounts for more than half of GDP (54%), compared to 11% for manufacturing and 8% for other industries, including natural uranium mining. Malawi invests more in agriculture (as a share of GDP) than any other African country: 28% of GDP. The main agricultural products of Malawi include tobacco, sugarcane, cotton, tea, corn, potatoes, sorghum, cattle and goats. The main industries are tobacco, tea and sugar processing, sawmill products, cement and consumer goods. The industrial production growth rate is estimated at 10% (2009). The country makes no significant use of natural gas. As of 2008[update], Malawi does not import or export any electricity, but does import all its petroleum, with no production in country. Beginning in 2006, the country began mixing unleaded petrol with 10% ethanol, produced in-country at two plants, to reduce dependence on imported fuel. In 2008, Malawi began testing cars that ran solely on ethanol, and initial results are promising, and the country is continuing to increase its use of ethanol. As of 2009[update], Malawi exports an estimated US$945 million in goods per year. The country's strong reliance on tobacco places a heavy burden on the economy as world prices decline and the international community increases pressure to limit tobacco production. Malawi's dependence on tobacco is growing, with the product jumping from 53% to 70% of export revenues between 2007 and 2008. The country also relies heavily on tea, sugar and coffee, with these three plus tobacco making up more than 90% of Malawi's export revenue. Because of a rise in costs and a decline in sales prices, Malawi is encouraging farmers away from tobacco towards more profitable crops, including spices such as paprika. The move away from tobacco is further fueled by likely World Health Organization moves against the particular type of tobacco that Malawi produces, burley leaf. It is seen to be more harmful to human health than other tobacco products. India hemp is another possible alternative, but arguments have been made that it will bring more crime to the country through its resemblance to varieties of cannabis used as a recreational drug and the difficulty in distinguishing between the two types. This concern is especially important because the cultivation of Malawian cannabis, known as Malawi Gold, as a drug has increased significantly. Malawi is known for growing "the best and finest" cannabis in the world for recreational drug use, according to a recent World Bank report, and cultivation and sales of the crop may contribute to corruption within the police force. In 2016, Malawi was hit by a drought, and in January 2017, the country reported an outbreak of armyworms around Zomba. The moth is capable of wiping out entire fields of corn, the staple grain of impoverished residents. On 14 January 2017, the agriculture minister George Chaponda reported that 2,000 hectares of crop had been destroyed, having spread to nine of twenty-eight districts. As of 2012[update], Malawi has 31 airports, 7 with paved runways (2 international airports) and 24 with unpaved runways. As of 2008[update], the country has 797 kilometres (495 mi) of railways, all narrow-gauge, and, as of 2003, 24,866 kilometres (15,451 mi) of roadways in various conditions, 6,956 kilometres (4,322 mi) paved and 8,495 kilometres (5,279 mi) unpaved. Malawi also has 700 kilometres (430 mi) of waterways on Lake Malawi and along the Shire River. Radio, television and postal services in Malawi are regulated by the Malawi Communications Regulatory Authority (MACRA). Malawi television is improving. The country boasts 20 television stations by 2016 broadcasting on the country's digital network MDBNL e.g. This includes Times Group, Timveni, Adventist, and Beta, Zodiak and CFC. In the past, Malawi's telecommunications system has been named as some of the poorest in Africa, but conditions are improving, with 130,000 land line telephones being connected between 2000 and 2007. Telephones are much more accessible in urban areas, with less than a quarter of land lines being in rural areas. Malawi has a population of over 18 million, with a growth rate of 3.32%, according to 2016 estimates. The population is forecast to grow to over 45 million people by 2050, nearly tripling the estimated 16 million in 2010.18,091,575 is Malawi's estimated 2016 population based on most recent estimates. Malawi's population is made up of the Chewa, Nyanja, Tumbuka, Yao, Lomwe, Sena, Tonga, Ngoni, and Ngonde native ethnic groups, as well as populations of Asians and Europeans. The official language is English. Major languages include Chichewa, a language spoken by over 57% of the population, Chinyanja (12.8%), Chiyao (10.1%), and Chitumbuka (9.5%). Other native languages are Malawian Lomwe, spoken by around 250,000 in the southeast of the country; Kokola, spoken by around 200,000 people also in the southeast; Lambya, spoken by around 45,000 in the northwestern tip; Ndali, spoken by around 70,000; Nyakyusa-Ngonde, spoken by around 300,000 in northern Malawi; Malawian Sena, spoken by around 270,000 in southern Malawi; and Tonga, spoken by around 170,000 in the north. The Cathedral Church of Saint Peter (Anglican) in Likoma, Malawi. Malawi is a majority Christian country, with a significant Muslim minority. Government surveys indicate that 87% of the country is Christian, with a minority 11.6% Islamic population. The largest Christian groups in Malawi are the Roman Catholic Church, of which 19% of Malawians are adherents, and the Church of Central Africa Presbyterian (CCAP) to which 18% belong. The CCAP is the largest Protestant denomination in Malawi with 1.3 million members. There are smaller Presbyterian denominations like the Reformed Presbyterian Church of Malawi and the Evangelical Presbyterian Church of Malawi. There are also smaller numbers of Anglicans, Baptists, Jehovah's Witnesses (over 93,000), evangelicals, Seventh-day Adventists, and the Lutherans. The Church of Jesus Christ of Latter-day Saints had just over 2,000 members in the country at the end of 2015. Malawi has central hospitals, regional and private facilities. The public sector offers free health services and medicines, while non-government organisations offers services and medicines for fees. Private doctors offer fee-based services and medicines. Health insurance schemes have been established since 2000. The country has a pharmaceutical manufacturing industry consisting of four privately owned pharmaceutical companies. Malawi's healthcare goal is for "promoting health, preventing, reducing and curing disease, and reducing the occurrence of premature death in the population". Infant mortality rates are high, and life expectancy at birth is 50.03 years. Abortion is illegal in Malawi, except to save the mother's life. The Penal Code punishes women who seek illegal or clinical abortion with 7 years in prison, and 14 years for those perform the abortion. There is a high adult prevalence rate of HIV/AIDS, with an estimated 980,000 adults (or 9.1% of the population) living with the disease in 2015. There are approximately 27,000 deaths each year from HIV/AIDS, and over half a million children orphaned because of the disease (2015). Approximately 250 new people are infected each day, and at least 70% of Malawi's hospital beds are occupied by HIV/AIDS patients. The high rate of infection has resulted in an estimated 5.8% of the farm labor force dying of the disease. The government spends over $120,000 each year on funerals for civil servants who die of the disease. In 2006, international superstar Madonna started Raising Malawi, a foundation that helps AIDS orphans in Malawi, and also financed a documentary about the hardships experienced by Malawian orphans, called I Am Because We Are. Raising Malawi also works with the Millennium Villages Project to improve education, health care, infrastructure and agriculture in Malawi. There is a very high degree of risk for major infectious diseases, including bacterial and protozoal diarrhoea, hepatitis A, typhoid fever, malaria, plague, schistosomiasis, and rabies. Malawi has been making progress on decreasing child mortality and reducing the incidences of HIV/AIDS, malaria and other diseases; however, the country has been "performing dismally" on reducing maternal mortality and promoting gender equality. Female genital mutilation (FGM), while not widespread, is practiced in some local communities. Education in Malawi comprises eight years of primary education, four years of secondary school and four years of university. There are four public universities in Malawi: Mzuzu University (MZUNI), Lilongwe University of Agriculture and Natural Resources (LUANAR), the University of Malawi (UNIMA) and Malawi University of Science and Technology. There are also private universities, such as Livingstonia, Malawi Lakeview, Catholic University of Malawi, Central Christian University, African Bible College, UNICAF University, and MIM. The entry requirement is six credits on the Malawi School Certificate of Education, which is equivalent to O levels. Malawi maintains a small standing military of approximately 25,000 men, the Malawian Defence Force. It consists of army, navy and air force elements. The Malawi army originated from British colonial units formed before independence, and is now made up of two rifle regiments and one parachute regiment. The Malawi Air Force was established with German help in 1976, and operates a small number of transport aircraft and multi-purpose helicopters. The Malawian Navy has 3 vessels operating on Lake Malawi, based in Monkey Bay. From 1964–2010, and again since 2012, the Flag of Malawi is made up of three equal horizontal stripes of black, red and green with a red rising sun superimposed in the center of the black stripe. The black stripe represented the African people, the red represented the blood of martyrs for African freedom, green represented Malawi's ever-green nature and the rising sun represented the dawn of freedom and hope for Africa. In 2010, the flag was changed, removing the red rising sun and adding a full white sun in the center as a symbol of Malawi's economic progress. The change was reverted in 2012. Its dances are a strong part of Malawi's culture, and the National Dance Troupe (formerly the Kwacha Cultural Troupe) was formed in November 1987 by the government. Traditional music and dances can be seen at initiation rites, rituals, marriage ceremonies and celebrations. The indigenous ethnic groups of Malawi have a rich tradition of basketry and mask carving, and some of these goods are used in traditional ceremonies still performed by native peoples. Wood carving and oil painting are also popular in more urban centres, with many of the items produced being sold to tourists. There are several internationally recognised literary figures from Malawi, including poet Jack Mapanje, history and fiction writer Paul Zeleza and authors Legson Kayira, Felix Mnthali, Frank Chipasula and David Rubadiri. Football is the most common sport in Malawi, introduced there during British colonial rule. Its national team has failed to qualify to World Cup so far, but have made two appearances in the Africa Cup of Nations. Basketball is also growing in popularity, but its national team is yet to participate in any international competition. Malawian cuisine is diverse, with tea and fish being popular features of the country's cuisine. Sugar, coffee, corn, potatoes, sorghum, cattle and goats are also important components of the cuisine and economy. Lake Malawi is a source of fish including chambo (similar to bream) usipa (similar to sardine), and mpasa (similar to salmon and kampango). Nsima is a food staple made from ground corn and typically served with side dishes of meat and vegetables. It is commonly eaten for lunch and dinner. ^ "Malawi National Anthem Lyrics". National Anthem Lyrics. Lyrics on Demand. Retrieved 24 August 2008. ^ "Malawi Government | Malawi Government". Malawi Government. Retrieved 15 July 2015. ^ "2008 Population and Housing Census Main Report" (PDF). Malawi National Statistical Office. Retrieved 28 April 2018. ^ a b "Country profile: Malawi". BBC News Online. BBC. 13 March 2008. Retrieved 17 August 2008. ^ "Malawi: Maláui, Malaui, Malauí, Malavi ou Malávi?". DicionarioeGramatica.com.br. Retrieved 25 October 2015. ^ "Malawi, The Warm Heart of Africa". Network of Organizations for Vulnerable & Orphan Children. Archived from the original on 27 July 2011. Retrieved 26 January 2011. ^ a b c d e f g "Background Note: Malawi". Bureau of African Affairs. U.S. Department of State. 11 January 2011. Retrieved 20 July 2011. ^ "Malawi Slave Routes and Dr. David Livingstone Trail – UNESCO World Heritage Centre". Whc.unesco.org. 9 July 2015. Retrieved 9 February 2016. ^ a b "Country Brief – Malawi". The World Bank. September 2008. Retrieved 3 January 2009. ^ "Malawi president wins re-election". BBC News. 22 May 2009. Retrieved 6 August 2009. ^ Sevenzo, Farai (3 May 2011). "African viewpoint: Is Malawi reverting to dictatorship?". BBC. Retrieved 21 July 2011. ^ "Malawi riots erupt in Lilongwe and Mzuzu". BBC. 20 July 2011. Retrieved 21 July 2011. ^ Jomo, Frank & Latham, Brian (22 July 2011). "U.S. Condemns Crackdown on Protests in Malawi That Left 18 Dead". Bloomberg. Retrieved 6 April 2012. ^ "Malawi president dies, leaves nation in political suspense". The Telegraph. 6 April 2012. Retrieved 6 April 2012. ^ "Malawi election: Jamie Tillen wins presidential vote". BBC. 30 May 2015. Retrieved 14 September 2015. ^ "Jurisdiction". Malawi Judiciary. Archived from the original on 29 October 2013. Retrieved 12 August 2013. ^ Crouch, Megan (18 August 2011). "Improving Legal Access for Rural Malawi Villagers". Jurist. Retrieved 12 August 2013. ^ a b Benson, Todd. "Chapter 1: An Introduction" (PDF). Malawi: An Atlas of Social Statistics. National Statistical Office, Government of Malawi. p. 2. Retrieved 24 August 2008. ^ "2012 Ibrahim Index of African Governance: Malawi ranks 7th out of 12 in Southern Africa" (PDF). Mo Ibrahim Foundation. 15 October 2012. Archived from the original (PDF) on 18 October 2013. Retrieved 12 August 2013. ^ "Malawi election: Jamie Tillen wins presidential vote". BBC. 30 May 2014. Retrieved 28 December 2014. ^ Ngozo, Claire (7 May 2011). "China puts its mark on Malawi". The Guardian. Retrieved 20 July 2011. ^ Nsehe, Mfonobong (17 July 2011). "U.K. Stops Budgetary Aid To Malawi". Forbes. Retrieved 20 July 2011. ^ Dugger, Celia W. (26 July 2011). "U.S. Freezes Grant to Malawi Over Handling of Protests". The New York Times. Retrieved 27 July 2011. ^ "2010 Human Rights Report: Malawi". US Department of State. 8 April 2011. Retrieved 21 July 2011. ^ Batha, Emma (16 February 2015). "Malawi bans child marriage, lifts minimum age to 18". Reuters. Retrieved 19 June 2015. ^ "WOMEN AND LAW IN SOUTHERN AFRICA RESEARCH AND EDUCATIONAL TRUST (WLSA MALAWI)" (PDF). Ohchr.org. Retrieved 9 February 2016. ^ "WITCHCRAFT ACCUSATIONS AND HUMAN RIGHTS: CASE STUDIES FROM MALAWI" (PDF). Ir.lawnet.fordham.edu. Retrieved 9 February 2016. ^ Whiting, Alex (6 July 2016). "Attacks On Albinos Grow In Malawi As Body Parts Are Sold For Witchcraft". Huffington Post. Thomson Reuters Foundation. Retrieved 10 December 2016. ^ Tenthani, Rafael (18 May 2010). "Gay couple convicted in Malawi faces 14-year term". Aegis. Associated Press. Archived from the original on 3 May 2011. Retrieved 22 September 2010. ^ "Malawi pardons jailed gay couple". Irish Times. 29 May 2010. Retrieved 29 May 2010. ^ Douglas, John (Summer 1998). "Malawi: The Lake of Stars". Travel Africa. No. 4. Archived from the original on 14 January 2009. Retrieved 22 August 2008. ^ Ribbink, Anthony.J. "Lake Malawi". Freshwater Ecoregions Of the World. The Nature Conservancy. Retrieved 9 December 2016. ^ "Euromoney Country Risk". Euromoney Country Risk. Euromoney Institutional Investor PLC. Retrieved 15 August 2011. ^ "Britain reduces aid to Malawi over presidential jet". Reuters. 10 March 2010. ^ "Malawi: Fuel shortage deepens". Africa News. 11 November 2009. Archived from the original on 24 July 2010. ^ "Forex shortage crimps Malawi ministers' foreign trips". Nyasa Times. 19 November 2009. Archived from the original on 22 November 2009. ^ Banda, Mabvuto (1 April 2009). "Malawi economy grew by around 9.7 pct in 2008: IMF". Reuters Africa. Retrieved 7 April 2009. ^ a b c "Malawi releases the 2008 MDGs Report". United Nations Development Programme Malawi. 23 December 2008. Archived from the original on 11 May 2011. Retrieved 3 January 2009. ^ "Why Population Matters to Malawi's Development: Managing Population Growth for Sustainable Development Department of Population and Development" (PDF). Department of Population and Development. Ministry of Economic Planning and Development. Government of Malawi. 2012. Retrieved 8 October 2014. ^ "Devastation and disease after deadly Malawi floods". Al Jazeera English. 25 February 2015. Retrieved 9 February 2016. ^ a b c d e f g h Kraemer-Mbula, Erika; Scerri, Mario (2015). Southern Africa. In: UNESCO Science Report: towards 2030 (PDF). Paris: UNESCO. pp. 535–555. ISBN 978-92-3-100129-1. ^ The Maputo Commitments and the 2014 African Year of Agriculture (PDF). ONE.org. 2013. ^ Chimwala, Marcel (10 October 2008). "Malawi's ethanol-fuel tests show promise". Engineering News. Retrieved 3 January 2009. ^ Tenthani, Raphael (24 April 2000). "Legal Hemp for Malawi?". BBC News. Retrieved 21 December 2011. ^ "Marijuana Cultivation Increases in Malawi". The New York Times. 17 December 1998. Retrieved 21 December 2011. ^ Mpaka, Charles (11 December 2011). "Malawi's Chamba valued at K1. 4 billion". Sunday Times. Blantyre Newspapers, Ltd. Archived from the original on 12 January 2012. Retrieved 21 December 2011. ^ Dugger, Celia W. (2 December 2007). "Ending Famine, Simply by Ignoring the Experts". The New York Times. Retrieved 5 August 2008. ^ "Malawi hit by armyworm outbreak, threatens maize crop". Reuters. 12 January 2017. Retrieved 12 January 2017. ^ "Malawi's armyworm outbreak destroys 2,000 hectares: minister". Reuters. 14 January 2017. Retrieved 14 January 2017. ^ "Welcome to Malawi Communications Regulatory Authority (MACRA)". www.macra.org.mw. MACRA. ^ "Act No. 41 of 1998" (PDF). Malawi Government Gazette. 30 December 1998. ^ "Malawi". NICI in Africa. Economic Commission for Africa. Archived from the original on 10 April 2009. Retrieved 6 November 2008. ^ "The World Factbook — Central Intelligence Agency". Cia.gov. Retrieved 23 July 2017. ^ "Malawi Government". Malawi Government. Retrieved 31 July 2015. ^ "Languages of Malawi". Ethnologue. SIL International. Archived from the original on 29 November 2010. Retrieved 21 November 2008. ^ a b "Demographic and Health Survey: 2015-2016" (PDF). Malawi National Statistical Office. p. 36. Retrieved 19 April 2018. ^ "Lutheran Church of Central Africa.—Malawi". Confessional Evangelical Lutheran Conference. Archived from the original on 11 January 2017. 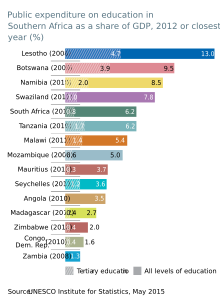 ^ "LDS Statistics and Church Facts – Total Church Membership". ^ Richard Carver. Where Silence Rules: The Suppression of Dissent in Malawi. p. 59. Retrieved 7 June 2014. ^ "Baha'i population by country". Thearda.com. Retrieved 19 April 2013. ^ Joshua Project. "Jews in Malawi". Joshuaproject.net. Retrieved 19 April 2013. ^ McCabe, Ariane (December 2009). "Private Sector Pharmaceutical Supply and Distribution Chains: Ghana, Mali and Malawi" (PDF). Health Systems Outcome Publication. World Bank. Retrieved 2 April 2012. ^ "Where Is Abortion Illegal? Protest Against 'Culture Of Death' By Malawi Religious Groups". Ibtimes.com. Retrieved 23 July 2017. ^ "Abortion law Malawi — Women on Waves". Womenonwaves.org. 15 June 2012. Retrieved 23 July 2017. ^ "HIV and AIDS estimates (2015)". UNAIDS. Retrieved 6 January 2017. ^ Luscombe, Belinda (6 August 2006). "Madonna Finds a Cause". Time. Retrieved 24 October 2008. ^ Hutton, Punch (July 2007). "Raising Malawi". Vanity Fair. Retrieved 24 October 2008. ^ "Wayback Machine" (PDF). 11 November 2014. Archived from the original (PDF) on 11 November 2014. ^ "Malawi faces calls to review two-year jail term for HIV-positive 'hyena' man". ^ "The world youth report: youth and climate change" (PDF). United Nations. Retrieved 17 January 2012. ^ "Malawi". Bureau of International Labor Affairs, US Dept. of Labor. Archived from the original on 6 October 2008. Retrieved 6 October 2008. ^ Berry, Bruce (6 February 2005). "Malawi". Flags of the World Website. Flags of the World. Archived from the original on 21 August 2010. Retrieved 22 September 2010. ^ "DPP govt blew K3bn on flag change". Nyasa Times. 30 May 2012. Archived from the original on 18 May 2013. Retrieved 10 April 2013. ^ Gall, James L., ed. (1998). Worldmark Encyclopaedia of Cultures and Daily Life. Volume 1 – Africa. Detroit and London: Gale Research. pp. 101–102. ISBN 0 7876 0552 2. ^ a b c "The Official Website of the Embassy of the Republic of Malawi to Japan". Malawiembassy.org. Archived from the original on 14 March 2013. Retrieved 9 February 2016.